Sharing the device traffic details with others. Ability to write custom software applications which can parse the data exported by the analyzer software. The HTML export file is formatted for easy viewing and for easy browsing of captured requests. The XML file can be read/parsed by custom software applications. Try our USB Monitoring Solution for FREE (30-day evaluation). 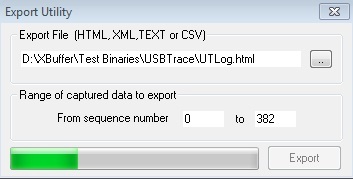 This entry was posted in USBTrace. Bookmark the permalink.